The internet is open to all: with Facebook, Twitter, Instagram, everyone can have a rant or enthuse. We all know that and allowing oneself to become irritated or annoyed is ridiculous. However, when it is my specialist subject I do feel my temperature rising as people who have never attended a show, spoken to the key players in the business or spent time investigating, spout forth. So, let’s set the record straight. Everyone I spoke to told me how busy couture is across the board, many of the new or less familiar names are doing very nicely and the quality and techniques have not been lost, in fact they are being explored and expanded. Rami Al Ali, Antonio Grimaldi, and George Hobeika – three very different designers – based their collections entirely around beauty, quality, technique, and the clients. Clothes whose craft and construction in these three cases especially, has absolutely no need to shout or scream for attention and whose designers are gentlemen who see women in reality. No OTT styling, accessories or hair and make-up. Clothes that whisper luxury, ateliers, desire, and seduction but with the coolness of Grace Kelly. Colour especially is achieved with muted rose petal pinks, eau de nil greens and although bright red or glittering rich embroideries may feature, it’s the whisper of colours which only appear in the finest quality fabrics which these designers spotlight. Valentino designer Pierpaolo Piccioli has now achieved a kind of nirvana of slow, modest, fluid and out of this world beauty in his clothes. This season his models wafted through the salons of the Hôtel Salomon de Rothschild as though on air, and indeed air drifted through the clothes concealing the intensive craft and workmanship involved in the construction and decoration of the pieces. From the opening colour layering through to the billowing red gown at the end every single piece was perfect, beautiful, and somehow calm. Even when glitter appeared it seemed mellow and sunlit, not brash nor vulgar. The baroque and renaissance curlicues beloved by Pierpaolo and the flaring silhouettes were strong. Bertrand Guyon at Schiaparelli celebrated colour in so many ways this season with navy and deep teal, plum and petunia, jonquil and violet, midnight navy and deep moss green. Shocking pink was there of course but it’s the surprise ribbon of mousseline peeping out or the streamer trailing inside a plisse soleil skirt which enchants and delights. The swirling dance dresses and the finale pieces in tints so pale I failed to find words to describe them gave a new romanticism to the collection, and recalled Schiaparelli’s love of parties and dressing up. Zuhair Murad has developed his signature over some seasons, there is a new softness to the glamour, and as with many others a romanticism and wistful narrative underlying the pieces. Grey and new soft shades with embroideries shimmering and glinting as they wound their way across the tulle, mousseline, crepe and velours caressed the wearer. There was an almost Guinevere or Lady of Shalott enchantment to the collection as the light created a mist through the fabrics and fronds of ostrich undulated as the models went past. Julien Fournié and Alexis Mabille seem at first glance very different. But, they are both French, uphold the integrity of Paris haute Couture and both have a vision of a woman who they pitch perfectly to each season. However, this season both were on top form with Mabille executing a gown for La Dame aux Camélias, a cascade of ruffles for La Paiva and a jacket entirely composed of golden roses with jewelled centre perfect for Mistinguett. Fournié also looked at Mistinguett in Rachel-coloured dance dresses. His other muses might be Jacqueline Delubac, or Arletty, as he draped and cut slender romantic pieces for centre stage entrances. Hyun Mi Nielsen is a designer to watch. Edgy and yet respectful of couture, classic and Avant Garde, her collection twisted and turned between tailored pieces to the volumes of gowns. The trails of panels or scarf extended the line and as the models dashed through the salons this brilliant designer cast a spell. New Couture magic. Xuan had one dress which summarised for me her brilliance; it was a cascade of face powder organza ruffles built upon the simplest slip of matching satin. Romantic yet modern, couture craft and todays attitude. The tiny collection was perfectly balanced and the silhouettes clear and true. Ronald van der Kemp opened the couture season with a sparkling and charismatic collection. A hint of retro and a hint of old style couture salon shows presented pieces created from a form of “upcycling”. Truth to tell, the interesting part of the story is the clothes, and what clothes. Emerald green George Sand draped blouse combined with a floral bustle skirt, a black coat like the Goya painting La Maja Desnuda, and a bride in true couture tradition to close the show, whose dress seemed assembled from dreams rather than fabric, with lace, poult taffeta and tulle swept into a Tissot train. Every moment was a marvel of storytelling and inspired techniques and skills. To summarise Alexandre Vauthier: Glamour, Studio 54, models – dancing, laughing, posing – polished chignons by Sam McKnight, polka dots, ruffles and oversized bows, glamour and sharp knife-like tailoring, drama and making an entrance. This was camera ready couture where the quality, shine and surface was glossy and close up perfect. Brilliant couture attitude in the footsteps of Yves Saint Laurent or Halston. All in all, a sense of uplift and fun and a real statement by a confident and assured designer. 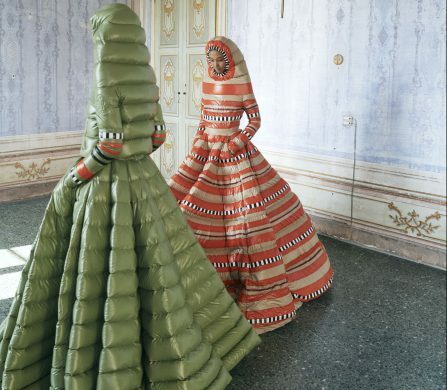 Finally, who but Jean Paul Gaultier can do Christmas in July with snow, and switch from Nordic ski sweaters to saris, and Maharajas without missing a beat or causing a jarring note? Loads of standout looks and magical Gaultier inventions, always with an eye on the skills and heritage of couture but dealt with in his own personal style and with both his passion and heart and his tongue in his cheek. A black velvet sari dress was magnificent and the metallic Indian icon coat, and the marrons glacés draped jersey; of course, the scarlet draped jersey dress and the arran sweater in satin were terrific. But the stand out was a glittering red Nordic ski sweater teamed with the most amazing white on white heavily encrusted dévoré long, slim skirt. Pure genius from a man who has couture in his veins. It’s just a small indication of why couture is good and healthy, why you need to see it and to find out that private clients are queueing up to try and buy. And why the beauty and glory of the traditions and crafts are alive and well. At the exhibition celebrating 70 Years of Dior – Dior, Couturier Des Rêves at Les Arts Décoratifs – the heart and core of the space is a skyscraper room of toiles with samples of the tailoring and flou (soft sewing) workrooms with Dior atelier staff working. Is there really anything else to say?